Arrive Coimbatore and Transfer to Palakkad by surface. Evening is at leisure.Over night stay at the resort . Early morning experience yoga, enjoy the best Ayurvedic massages. 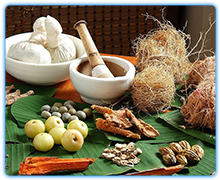 Consult with the experienced ayurvedic professionals or doctors. You may also experience the powerful Panchakarma therapies and dhara to remove toxins and rejuvinate the physiology. Over night at the resort. After breakfast leave for Cochin. Reach Cochin and check-in to the resort. 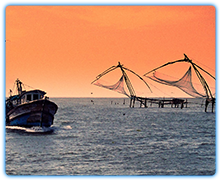 Later go on a short sight seeing of Cochin including Mattancherry Palace, Jewish Synagogue, Fort Cochin etc. Evening witness Kathakali show & later transfer to the hotel for over night stay. After breakfast, visit Morning city tour visiting the Dutch Palace, with its 17th Century murals of Ramayana, Jewish Synagogue, built in 1568, housing Grand Scroll of the Old Testament. Also visit Fort Cochin and St France’s Church, the oldest European church in India. Vasco de Gama, who discovered India, was first buried here. In the evening a sunset harbor cruise to see the Bolgahtty Island and the Chinese fishing nets. Return to the hotel for over night stay. After breakfast, drive to Kumarakom. Reach & transfer to the Ayurvedic Resort. Relax and enjoy the facilities of the resort including Yoga, Massages, Nature walks, village visit, sunset cruise, swimming, fishing etc.. Consultations with most experienced Ayurvedic professionals and experience Ayurveda. Over night at resort. After breakfast, drive to Trivandrum. Check-in to the hotel and the rest of the day is free for personal activities and relaxing. After breakfast, drive to Kanyakumari for a day trip. Full day at sight seeing including Devi Kumari Amman Temple, Vivekananda Rock Memorial, Gandi Memorial, padmanabhapuram palace etc. Kanyakumari is the southernmost point of peninsular India and the meeting point of three oceans-the Bay of Bengal, the Arabian Sea and the Indian Ocean. Besides its importance as a Hindu pilgrim center, it is famous for its beautiful views of sunrise and sunset over the waters. The multicolored sand is a unique feature of the beach here Over night at Trivandrum.